Caribbean Inspiration – For the love of color! I am inspired by the multitude of colors from the Caribbean – the beautiful turquoise seas, the green of the lush tropical forests, the warmth of the bright sun and the uplifting spirit of the colorful houses. 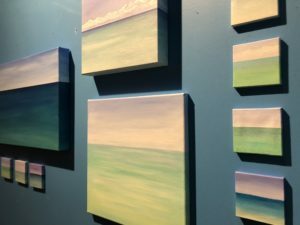 In my acrylic and encaustic paintings I aim to capture these colors while illustrating various vignettes found on my travels to the islands. 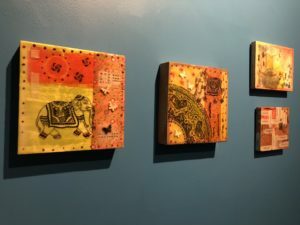 The elephant inspired encaustic works are drawn from the love of color. I hope as you view my work you feel the tranquility of the Caribbean, the warmth of the sun and the cheerfulness of the bright colors. Posted in Home, Tearoom Events.